XL double mattress is 5” longer version of a regular double mattress size with actual dimensions 54 inches (137.2 centimeters) wide and 80 inches (203.2 cm) long. Total area of mattress is 4320 square feet (27,879 square centimeters). It is about 7% bigger than regular double and approximately 10% smaller than queen mattress size. Placed in the 12’ x 12’ bedroom XL double bed will take only about 22% - 25% of its space depending on bed type, leaving a space for dressers and nightstands. Extra long double mattress designed for two higher people, with a total space 2160 square feet (27,879 square centimeters) for each. It is definitely a good option for a smaller bedroom dimensions saving some space. It also might be a perfect choice for larger master bedrooms, but many people might prefer to go with more roomy options such as queen or king size mattress considering the fact that 27” width for a person might not be enough especially if the people are bigger than average. The thickness of XL double mattress might vary from 5 to 20 inches and with base total heights might range from 9” to 26”. It will weigh less than regular full mattress proportionally to its actual dimensions. Dimensions of extra long full - double size mattress were proportionally resized according to average men heights - 5 feet 10 inches (1.778 meter) and average women heights 5’ 4 ½" (1.638 meter). 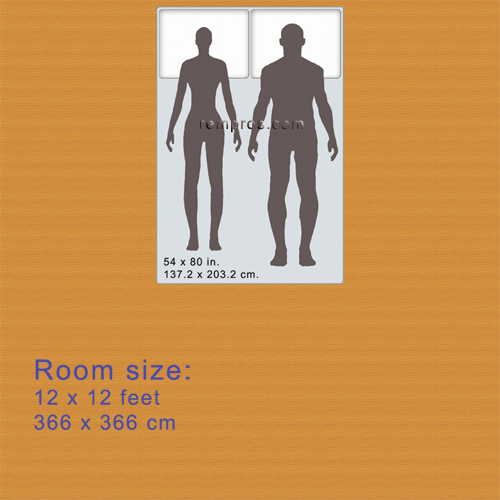 Bedroom size - 12 x 12 feet (366 x 366 centimeters).